Home » Vegetables » Hullo Eggplant! 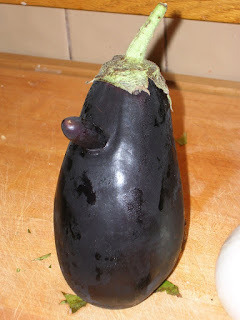 This eggplant looks like a gnome! 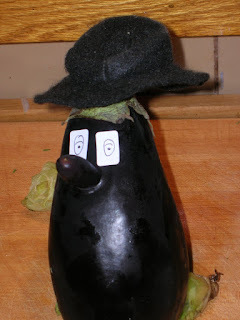 We received him in this week's farm share and he has the funniest little sprout of a nose coming off him. That and his little skull cap makes him the spitting image of a little purple gnome you'd see out in a faerie ring. I just felt his existence should be shared with the world before I roast him and turn his innards into baba ghanoush. Almost makes you sad to have to eat it! Very funny! Well, if we can eat tail, why not the nose from an eggplant. I know! Isn't he a handsome little fellow!